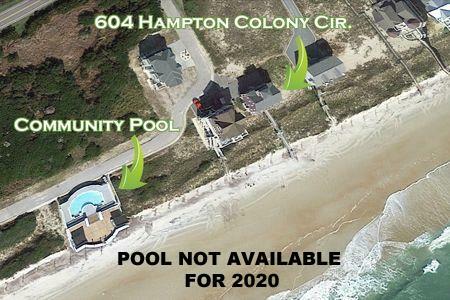 A Point of View is a luxurious beach home located on the front row with direct ocean frontage in the exclusive beachfront community of Hampton Colony in North Topsail Beach. This sprawling home has 6 bedrooms with 4.5 baths. It is equipped with 3 kings, 1 queen, 2 twins, 1 pyramid, 1 single futon and a queen sleeper sofa which will accommodate 16 guests comfortably. For your added enjoyment and entertainment this home is equipped with Major Amenities to include: 7 TV’s, DVD, WiFi, Game Room with game table (pool & air hockey), soaking tub in first floor Master, large food pantry, outside showers, ground level Wet Bar with Fridge adjacent to a large 6 person Hot Tub. Last but certainly not least a luxurious Oceanfront Community Pool which is only steps from the home. This home has a bad weather entry from the garage level which directs you up to the first level living area. This level has a very spacious kitchen which is well equipped with everything needed for basic meal preparations. For your convenience there is a large food pantry adjacent to the kitchen as well as a half bath. The home has an open floor plan which flows from the kitchen out to the dining area where you will find a large dining table and bar area with enough seating to accommodate a large family. Adjacent to the dining area you will find the living room to be spacious with plenty of comfortable seating for the entire family. Mounted to the living room wall is a very large flat screen TV/DVD for enjoying those not to miss ball games and special family movies. There is also a Fireplace but it is only for decorative purposes and not to be utilized. From this level you will have direct access out to the large oceanfront deck (TREX decking) that you will find well equipped with plenty of comfortable seating for enjoying those great ocean views. This deck provides direct access out to the beach by a walkway across the sand dune and out through a special designed and framed Arbor/ Trellis structure that will lead you directly onto the sparking beach sand of Topsail Island. You Have Now Arrived! Back inside and on this same living level you will find a very large first floor Master Bedroom with its own private bath that is equipped with a large soaking tub and double walk-in closets. This bedroom has a King bed and a large flat screen TV mounted to the wall. There is also from this room, direct access out to the oceanfront deck and on to the beach. As you move up to the second level of the home you will find three more sleeping quarters along with 3 full baths and a laundry area. There is an oceanfront bedroom with a King bed and a single futon that has access out to the 2nd level oceanfront balcony. This room has a private bath with a tub/shower combination. This bedroom is also equipped with a large flat screen TV mounted to the wall. The next area is a bunk room which would be great for kids and is equipped with a Pyramid bed (sleeps 3) and a queen sleeper sofa which will accommodate a total of 5 in this room. In this room you will find a large flat screen TV mounted to the wall for the kids to enjoy their favorite games and movies. This room is connected with the laundry area and you will also find a convenient full bath with shower. Just around the corner from the laundry area and on this same level you will find another bedroom with a King bed that has direct access out to the oceanfront balcony. This bedroom has a large flat screen TV mounted to the wall and there is a convenient full bath just outside the door in the hallway. On the next level of the home you will find two other bedrooms that provide for much privacy. One of the bedrooms has a queen bed and is equipped with a TV/DVD. The other bedroom has 2 twins and is equipped with a TV/DVD. The upper top level of the home has views galore and is utilized as the Game Room. It is equipped with a reversible game table that has a pool table on one side and air hockey on the other side. This upper level has panoramic views of the complete surrounding area. Windows are on all four sides and a door leads you out to a walkway/deck area on three sides of the game room. This room is a great place for the kids to enjoy or even the adults can bring their binoculars and see Topsail Island from high above. Last but not least, this home is in a development that provides a luxurious oceanfront community pool for the guests to enjoy. 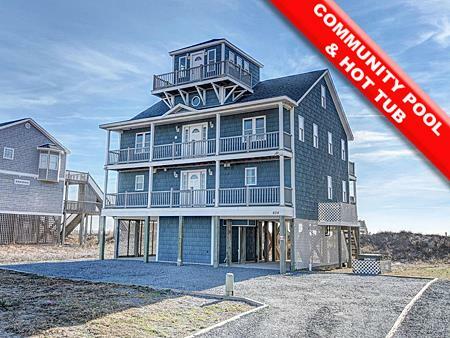 It is located only steps from this home and sits directly on the oceanfront. As you can easily see, this home has it all from a great oceanfront location to Major Amenities that provide you and your family maximum enjoyment. What a vacation this house provides! THE HOT TUB IS AVAILABLE YEAR ROUND WITH AN $80.00 ACTIVATION FEE FOR THE VALUE, PRICE BREAK, AND GETAWAY SEASONS ONLY. THERE IS NO FEE FOR THE PRIME SEASONS. THIS HOME IS WEDDING AND EVENT FRIENDLY WITH A $500.00 EVENT FEE ALONG WITH A $150.00 CLEANING FEE. THERE WILL BE A $800.00 REFUNDABLE SECURITY DEPOSIT. THE SECURITY DEPOSIT WAIVER WILL NOT APPLY TO WEDDINGS AND EVENTS.